Water pollution is one of the major concerns for the whole world nowadays. Water pollution results when contaminants are introduced into the natural environment by the humans. To curb the situation many organizations as well as individuals have already came forward; the Recycled Island Foundation is one among them. This organization is transforming piles of trash into a gorgeous island – a way to fight river pollution. 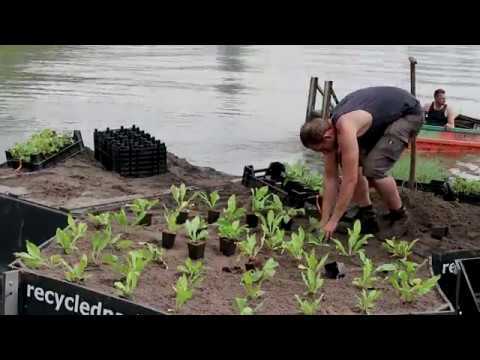 The Recycled Island Foundation has been collecting litter from the Maas River in Rotterdam, South Holland and recycling it into floating islands that benefit people and the aquatic ecosystem on which they drift. It has been for a year and a half, the Recycled Island Foundation has used litter traps placed at strategic points along the river to collect trash from the water. After that, they sort and recycled the materials into hexagonal platforms that are designed to float on the river’s surface. By filling the platforms with greenery and native plant species, the platforms can benefit larger land critters and offer up shelter and breeding grounds for microorganisms and fish. The foundation’s first recycled park was just opened in Rotterdam on July 4th, after 5 years of research, development, and hard work. The innovative public space is 1,500 square feet of habitat made from 28 hexagonal platforms. The organization is now looking for new locations to continue their mission and build more beautiful parks out of the trash. Recycled Park first 140m2 open!